There are three questions to answer when fitting your compound bow. What draw length do I need? What draw weight should I shoot? For most people this is easy to decide, a right handed person chooses a right handed bow and a left handed person chooses a left handed bow. A small minority of people have their dominant eye opposite their dominant hand. This can create problems when aiming. Some people solve this by aiming with their weak eye and closing their dominant one. Others choose a bow to match their dominant eye and accustom themselves to shooting it against their natural "handedness". A few even lean their heads far enough over the bowstring so as to be able use their dominant eye for aiming. If you are one of these small minority we suggest closing your dominant eye as that works well in the majority of cases, however if you think another style would work best for you go ahead and choose a bow for that style. A bow is an individual thing and we are committed to helping you find what works best for you. We will gladly return or exchange a bow under our 60 day satisfaction guarantee until you find one that is comfortable. To determine your dominant eye make a small triangle with your hands and thumbs (see picture), hold it at arms length, and look through it at an object a few feet or more away. Close one eye and then the other. When one of your eyes closes you will see the view through the triangle shift. The eye you just closed is your dominant eye. The view shifts because your other eye took over when your dominant eye closed. When your bow is fitted at the proper draw length you will be at your most comfortable and accurate position. If the draw is too short your peep will be too far from your eye for a clear view, and your shortened power stroke will cost you speed and energy. Too long a draw and your release hand may not anchor firmly against your cheek, your bow arm will want to hyperextend causing a loss of control, and your bowstring can contact your cheek or clothing destroying the accuracy of your shot. Here is an easy way to find your draw length, simply stand upright with your hands stretched out (hold naturally, do not hyperextend) and measure your arm span from fingertip to fingertip. Take this measurement in inches and divide by 2.5. This will give a good working draw length for your bow. If you want to try a different draw length most bows are adjustable by changing or rotating a module (a small metal piece) on the cam or cams. However we recommend you stick with the starting draw length, straying to far will lead to instability and reduced accuracy. 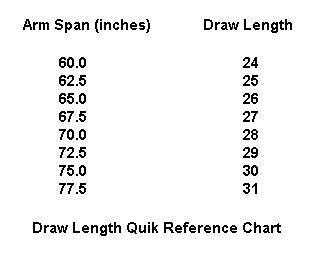 Use the following chart as a quick reference on choosing your draw length. Your ideal draw weight is one you can pull in a smooth, controlled manner under hunting conditions. If you hunt in cold weather which most of us do, the combined effects of cold muscles and adrenaline will reduce your controlled draw weight 10 to 15 pounds from what you can manage indoors or on a warm day. Every year we encounter hunters who failed to reach full draw in the presence of game animals! Don't make this mistake, the modern compound bow is highly efficient and maximum poundage is not required for even large game animals. Diamond Archery bows adjust downwards ten pounds from their listed weight. A 70 lb bow will adjust down to 60 lbs, a 60 lb bow down to 50 lbs. The Browning Archery Illusion is adjustable within a fifteen pound range downward from the poundage marked on the bow limb. A 70 lb bow adjusts down to 55 lbs and a 60 lb bow down to 45 lbs. Most men find somewhere between 55 to 65 lbs to be their comfortable maximum, for women it is 35 to 45 pounds. The following chart shows our recommended bow adjustment range for adults. Keep the following tips in mind when using it. A bow works slightly more efficiently when set in the upper end of its poundage range. For example if you would like to shoot 60lbs it is better to choose a 45-60 lb bow then to choose a 55-70 lb one and back it down to 60 lbs. When in doubt choose the lower poundage, you will still have plenty of power for hunting and will be sure to stay in control. new archers will increase the poundage they can handle by 10 or more pounds with just two weeks of daily practice. we are committed to helping you achieve success as an archer and will gladly exchange your bow for another if you feel you have selected the wrong size. Once you have selected the hand, draw length, and poundage for your bow you will be able to enter your requirements when ordering. If you would like more help in making these choices give us a call, we will be glad to answer your questions.